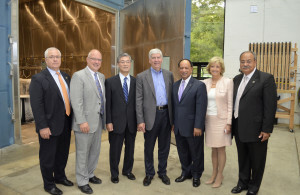 Attending the July 16 briefing at Lawrence Technological University were (L-R) Doug Smith, vice president of the Michigan Economic Development Corp.; Kirk Steudle, director of the Michigan Department of Transportation; Shigeto Tanaka, chairman of Tokyo Rope; Gov. Rick Snyder; LTU President Virinder Moudgil; LTU Provost Maria Vaz; and Nabil Grace, dean of LTU’s College of Engineering. MDOT Director Kirk Steudle and his staff and LTU’s Dean of Engineering Nabil Grace provided information on the bridge that is being completed on Eight Mile Road in Southfield in which the rebar and cables inside the concrete are made of carbon fiber reinforced polymer (CFRP) materials instead of steel. The corrosion of reinforced steel in bridge decks caused by de-icing salts is the leading cause of bridge deterioration in Michigan, according to MDOT. CFRP materials are corrosion-free. The design and specifications for the Eight Mile Road bridge were based on research at CIMR led by Grace. 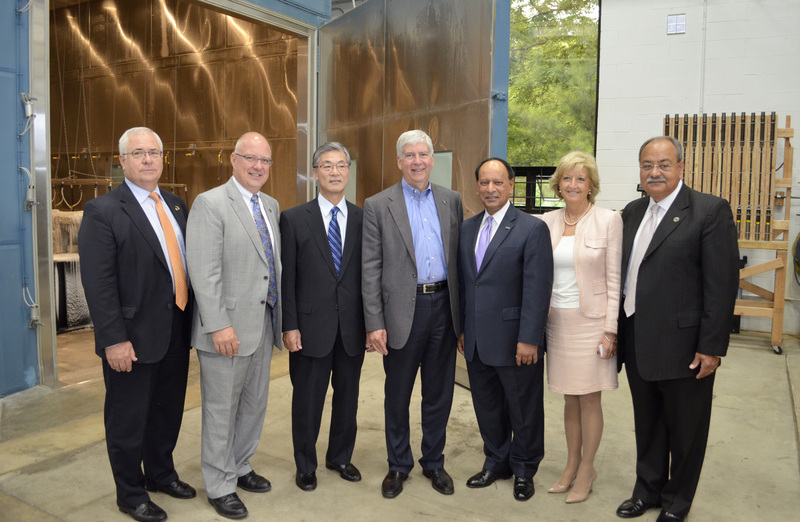 The Michigan Economic Development Corp. has committed $3 million to Tokyo Rope for the construction of a carbon-fiber manufacturing facility to be built in Michigan. MDOT has used CFRP materials from Tokyo Rope and research results from LTU on two other bridges: the Pembroke Avenue bridge over the Southfield Freeway (M-39) in Detroit in 2011, and the M-50 bridge over the Norfolk Southern railroad tracks in Jackson in 2012. The next CFRP project, which is scheduled for completion next year, is a bridge on I-94 over Lapeer Road in Port Huron. Grace and LTU research teams have been conducting research on CFRP and other innovative materials for bridge construction for more than 25 years. MDOT has been a partner in Grace’s quest for a corrosion-free bridge, which has also been supported by the National Science Foundation and other state and federal agencies. “The predicted result is a bridge system that will last twice as long as most bridges now in service with minimum repair work or reconstruction and a significant reduction in the long-term burden on taxpayers,” Grace said. An MDOT contract of about $690,000 is funding a four-year study at LTU to evaluate the long-term capacity and durability of CFRP pre-stressing and post-tensioning strands under various conditions. Another MDOT contract of $390,000 will fund a seven-year project to collect, analyze and review data from the bridges that have been built with CFRP materials as well as information and literature from other sources on this type of bridge construction. Lawrence Tech also has a $349,000 research contract from the Federal Highway Administration using pooled funds from the state transportation departments of Ohio, Oregon, Minnesota, Wisconsin, Iowa, and Michigan. The National Science Foundation has provided the LTU research team with about $340,000 in funding to support other CFRP-related investigations. “There is still a lot of work to do, but we are confident that our research here at Lawrence Tech will produce design guidelines for sustainable bridges that will still be in service in the next century,” Grace said.